Iraqi ghost soldiers: 50,000 got paid but didn't serve. 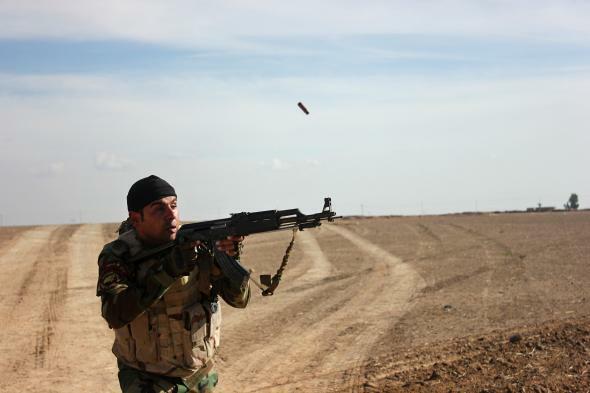 An Iraqi soldier in November in Diyala province. “Ghost soldiers” were men on the army payroll who paid their officers a portion of their salaries and in return did not show up for duty, enriching their commanders and hollowing out the military force. “Those 50,000 soldiers were revealed after an intense search through military documents and there will be a field search in order to put an end to this phenomenon and any other form of corruption,” Jaburi said. The city of Mosul, for example, was ostensibly defended by 25,000 soldiers and police officers—but when ISIS attacked it, Reuters quotes local officials as saying, only about 10,000 of those individuals were present. Iraqi and Kurdish forces have of late taken back some of the territory seized by ISIS earlier this year, though Mosul remains under the control of the terrorist group.